- Mr Salih, please tell us what exactly happened? - There has been no any official announcement that my name has been removed from Interpol’s wanted list. But people have been telling me that I am no longer found on the site where it used to be listed. We checked, and a number of people were specifically looking for me [on these sites] and found nothing. Now, we have been talking to our attorneys in France and they have officially contact-ed Interpol. For now, we are awaiting their response. Apart from that, I have learned a week ago that a police poster of me and my brother Maksud Bekzhan that used to be found everywhere in Uzbeki-stan, seems to have been removed. But so far, I have seen no official announcement on this neither from the Uzbek authorities nor Interpol. - And when was the last time you checked Interpol’s Wanted List yourself? - That was 15 to 20 days ago. - And when did Interpol issue the warrant on your name? Still during the 1990s? - Do you think that your case stands for a change in Uzbek state policy towards political dissidents, opponents or is something entirely else going on? - If only I knew! My lawyers have already in the past asked Interpol to delete my name from their list of suspects and have also submitted supporting documentation like the decision of a court in Prague [on my case] in 2001. At the time, I was tried there on behest of the Uzbek government but quickly acquitted and set free. Furthermore, we have submitted a 2006 decision by the United Nation’s Hu-man Rights Committee that, in fact, acquitted me on request of my lawyer Salima Kadyrova. So, these two documents were forwarded to Interpol through my lawyers a month ago and maybe that is why my name has been removed from their list. It is also possible that the Uzbek authorities have really decided to change their policy and pursue a softer course with regards to political prisoners since my younger brother Muhammad Bekzhan was also released. Moreover, my other brother Maksud got a call from the local police in Khorezm province and was told that all charges against him have been dropped and that he can return home. There has not been any such announcement concerning me and my name on Interpol’s list, though. - And so far, no Uzbek official has been in contact with you with a proposal to return home? - No. But I can say that three weeks ago I dispatched an online petition to the President of Uzbekistan to clear my name, restore all my constitutional rights and overturn the 1999 court verdict that was handed down for allegedly organising the explosions in Tashkent that year. I am talking about this pub-licly for the first time now and am waiting for a reaction. The website told me that my request is being processed and I hope that I will be rehabilitated, my rights restored and my house and flats returned. Muhammad Salih is a well-known Uzbek dissident, writer and poet. He lives in Turkey. In 1990, he founded the democratic opposition party “Erk” and was the only candidate running against Islam Kari-mov in the December 1991 presidential election. He was arrested in 1993 for “high treason” and left the country after he was released due to international pressure. In 1999, he was sentenced in absentia to 15 and a half years in prison. He was arrested at Prague Airport in 2001 and taken to the Pankrác de-tention facility but was soon released since the documents that were submitted by the Uzbek authorities to support their charges were de-clared insubstantial by a Prague court. In 2011, Salih became the leader of the People’s Movement of Uzbekistan (NDU), the largest association of the exile opposition. In February 2017, Salih’s Brother Bekzhan was released after spending 17 years in prison. I have furthermore written that this is not a plea but a demand to restore my rights and that I do not seek a pardon because I am not guilty of anything. I am seeking rehabilitation. So now I am waiting for a reply. As soon as the authorities answer, I will make a very important declaration. Because then we can conclude if the current government is really serious about reform or if we are just dealing with a large populist campaign. We will see. So, my petition is, in fact, some sort of test what kind of government we are facing. The release of po-litical prisoners and my brother, as well as all the other steps we have seen so far, can in the end just turn out to be liberal smokescreens. Although I hope for the best and that this might truly be the be-ginning of political reforms in Uzbekistan, the attitude of the authorities towards me, our movement and the opposition, in the end, depends on the answer to my petition. I have not made any official declaration but have only handed in a request like any other of the millions of Uzbek citizens. I have not been seeking any special treatment, but merely filed an ordinary petition and am waiting for an answer. I hope that it will be positive since there is simply no reason to turn me away. If Mirziyoyev is really genuine about reforming the old Karimov system, the answer has to be positive. - Do you think that the charges against you, the court trial in absentia and your sentencing have been personally ordered by Karimov? Or was Rustam Inoyatov, the head of the Uzbek security service, in-volved? - Karimov personally took these decisions upon initiative and support of Inoyatov who was seeking to justify his repressive methods this way. He did everything to keep Karimov in a state of alarm and painted the picture of a much more aggressive, dangerous and radical opposition than ever existed in Uzbekistan. Dissidents like me never fought against the regime with arms! The mujahideen, guerrilla opposition indeed literally was fighting the government with guns. We never took up arms, never! Nonetheless, and I know this very well from my sources, Inoyatov frightened Karimov with tales that Salih was supposedly planning an intrusion from Kyrgyzstan or Tajikistan. It was not Tahir Yuldashev who frightened Karimov; it was Salih. 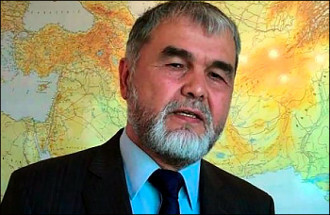 Inoyatov was inventing plots that included fighters in Afghanistan, even in Kazakhstan and received tens, hundreds of millions of dollars to counter those supposed threats. It was really like that. Karimov was, of course, a maniac like any other dictator and spared no expense to invest into so-called national security. He did not sleep and always had nightmares about Salih who was, in his mind, about to burst into his native Uzbekistan at any moment. There can be no doubt that Inoyatov was central in bringing all this about and built his empire around my name. He is today one of Uzbekistan’s billionaires. He invented and inflated this Salih-scare. Every day his security service would report: Salih is in Istan-bul, drinking tea with someone. But I think that Mirziyoyev is an intelligent man who saw through this. He was serving as prime minister for 12-13 years, and he knows that the charges against me were all based on lies. He knew it perfectly well. If he is sincere in his drive to reform Uzbekistan, he must pub-licly declare that the charges against me were wrong and a mistake, return our deprived constitutional rights to us and make the path for us to return. - And what is the next step? If Mirziyoyev will enable you to come back to Uzbekistan, will you then demand the legalisation of opposition parties and an open political system? - You see, I do not want anybody’s help. I do not ask for any utopian, non-existent rights. I just de-mand those personal rights that are granted by God as well as in the Constitution that the Uzbek peo-ple have adopted. And nothing more! Of course, I will do what I want. I can only return to Uzbekistan as a completely free man. I will not go if there will be the slightest infringement on my freedom. And I will continue to fight as determined as I have fought these past 30 years against Karimov. I will seek no concession. - They fear that an armed conflict will break out? No. If I were on the side of those who try an armed rebellion, I would have joined them long ago. I have had plenty of opportunities to do just that, but I haven’t because this is simply not my way of struggle. That is why I want to return to Uzbekistan as a free man if I return. I have always been free and always wrote what I wanted. I never published what I didn’t believe – even in Soviet times. So, I either return under these circumstances, or I won’t ever return – not as a slave, a half-slave or a person whose freedom is even slightly restricted. I want to return to Uzbekistan as a free, and com-pletely free man.